S. Craig Zahler is a filmmaker, a novelist and a musician. His film credits include writing the script to the horror movie Asylum Blackout and directing the western Bone Tomahawk. When he’s not making movies or writing books, Zahler makes music as a drummer in the heavy metal band Realmbuilder that includes his good friend Jeff Herriott. 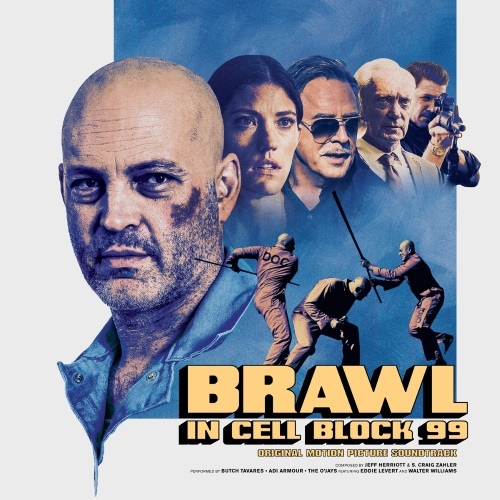 Zahler’s musical background makes it legitimate to wonder why we’d review the soundtrack for his upcoming film “Brawl In Cellblock 99.” That film stars Vince Vaughn as a former boxer who ends up in prison after a drug deal goes wrong. The movie takes its attitude from the 1970s era action films, even though Brawl In Cellblock 99 takes place in contemporary times – for comparison think of a Quentin Tarrentino soundtrack from a movie such as Jackie Brown. And like Tarrentino, Zahler looks to soul music from the 1970s to drive the action and to define his characters. The major difference is that Zahler composed original songs and then tapped soul legends Butch Tavares and The O’Jays, as well as Milwaukee based soul singer Adi Amour, to perform them. The three singers are distinctive. Tavares wraps his silky smooth and still rangy tenor that moves easily into falsetto range when he adds a howl on tracks such as “Give Her a Ride.” Age has added a bit more gravel to Eddie Levert’s gravelly baritone, and that quality adds to the emotion packed inside “God Bless My Mama,” a track that speaks of the sentiment that likely comes easily from those locked behind bars. Amour endows his baritone with a power packed youthfulness heard on a track that alternates between inspirational pop and contemporary Christian. This seven track soundtrack has four tunes that allow listeners to frame a scene from a movie that has yet to be seen. Tavares’ work on the blues infused mournful ballad “The Letter That Won’t Ever Be Sent” is standout. He steps into falsetto mode as he sings words onto the page of a letter intended but never sent to his lover. Combined with backing vocals that give the track the feel of the dirge, it brims with the kind of pathos and regret a man must feel when the state bars him from being with the one he loves. An arrangement that features changing tempos within the track along with Tavares’ energetic vcocals are what distinguish “You Are Yesterday.” Tavares is able use his tenor to express the frustration with a relationship that he is ready to walk away from. Meanwhile, the O’Jays’ talents are best put to use on “Buddy’s Business,” an up tempo cut with whirling strings, gospel infused backing vocals and a smooth funky bass line that will takes its spirit from PIR. The track tells the story of a guy who is out here playing the most dangerous game – street hustling. With Brawl In Cellblock 99, Zahler and Herriott have created an ambitious if somewhat uneven soundtrack that it its best gives listeners insight into the film’s characters and stands as a sincere homage to the films and music of the 1970s. It is unusual addition to the musical landscape in 2017, but it has enough good moments to move it beyond simply being a nostalgic piece aimed at those who remember an influential time in R&B history.